After years of vision and planning by IEMS faculty and staff, McCormick welcomed an outstanding inaugural class of Master of Science in Analytics (MSiA) students with a launch party on Wednesday, September 26. Thirty-two highly qualified students enrolled in the MSiA program, a unique analytics program housed in the Department of Industrial Engineering and Management Sciences. Organizers originally planned to start slowly, enrolling just 15 students in the first year, but they were so impressed by the caliber of the applicants that they accepted the program’s full capacity. 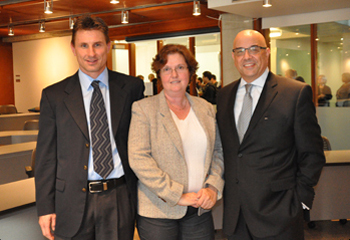 A featured guest at the MSiA launch party was Brenda Dietrich, an IBM fellow and vice president and chief technology officer for business analytics in the IBM Software Group. McCormick Dean Julio M. Ottino gave welcoming remarks during the event in the Ford Motor Company Engineering Design Center. As more businesses have begun looking to big data to study their customer base and optimize processes, the marketplace has experienced an overwhelming demand for analytics experts. McCormick’s MSiA program will provide that expertise, teaching students to identify patterns and trends; interpret and gain insight from vast quantities of data; and communicate their findings in practical, useful terms. “We conceived this program because we recognized that there aren’t enough trained individuals in this rapidly growing field,” said Diego Klabjan, professor of industrial engineering and management sciences and director of the MSiA program. “This is a top-notch, elite program, and we have a talented and enthusiastic group of students to work with. Students in the inaugural MSiA class have work experience ranging from investment banking to business analysis to information technology and hold degrees from institutions including Stanford University, the University of California-Berkeley, and Northwestern. Most completed their undergraduate degrees in related fields such as industrial engineering, mathematics, and economics, though backgrounds in physics and psychology are also represented. The students range in age from 22 to 48; one-third are women and one-third are international students. Throughout the 15-month program, the students will be exposed to industry through multiple channels, including a practicum, internship, capstone project, and coursework. While other master’s programs tend to be focused on one aspect of analytics — such as modeling or data mining — McCormick’s MSiA curriculum is more comprehensive, covering big data, unstructured data, and data visualization. The MSiA curriculum will be supplemented with guest lectures from influential analytics professionals. Two lectures are scheduled for the fall quarter: Bill Franks, chief analytics officer for Teradata, will speak on November 1, and Janet Wejman, former chief information officer for Continental Airlines, will speak on November 15. 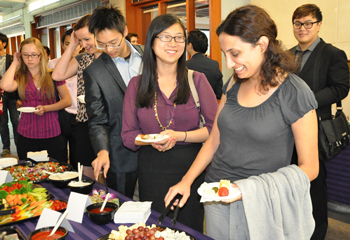 For more information about the MSiA program and upcoming events, visit http://www.analytics.northwestern.edu.